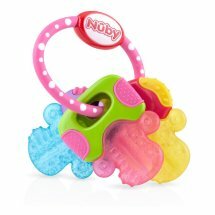 Nuby IcyBite Keys Soothing Teether 3m+. Nuby��� IcyBite��� Keys Soothing Teether 3m+. Stays cooler longer, helping soothe sore gums. Multi-surfaced teether learning through play!